Opening story ‘Beholders’ gives the reader a taste of what’s in store. ‘Beholders’ plugs into Britain’s penchant for grief and shows us a different and darker breed of celebrity. The evening news features the plight of a deformed infant, ‘Baby Hayley’, the doctors announcing to the concerned nation that they don’t expect Hayley to last out the week. The public respond to this by donning masks of the deformed baby in widespread support, which they wear on the tube, in the office, out in the streets. The story follows an everyday couple’s gradual descent into rebellion, a destructive pursuit of ugliness. Or perhaps it is merely a surrender, a caving in to the urban grotesqueness around them. Ugly has become the new beauty. Ashley turns the everyday on its head, and by the end of ‘Beholders’, you realise that between these pages, even the most mundane-looking ground can suddenly develop yawning chasms of social disaffection.‘D-Leb’ echoes this theme of anti-celebrity. The humour is dark but undeniably amusing, as celebrities begin to vanish inexplicably, and those in the limelight do all in their power to regain the status of ‘nonentity’. No one dares to risk recognition. Think of X-Factor, the current five-minute fame culture of Britain, only inverted. The result is intriguing and cleverly astute. Ashley proves himself as a shrewd commentator on modern British life as well as a fascinating and original storyteller. Overall, it’s difficult to name standout stories. All are compelling and well written. But for a taste of Ashley at his best, consider the lusty fairytale of ‘Play the Pipes of Pan’, the residential dread of ‘Flat Top’, or the tribal beat of ‘Stoners’, which juxtaposes man’s need to ‘get back to the garden’ with the contemporary small town club scene. The sense of loss that flows through ‘Canoe Boy’ lulls and soothes, tugging at the old heartstrings. Other stories verge on the abstract, such as ‘Nine Views of the Light of the World’, where Ashley’s incisive eye examines science, art and religion in a way that one can only describe as ‘surrealist journalism’. ‘The Short and the Long of It’ and ‘Today We Were Astronauts’, both great stories, are also included in this collection. 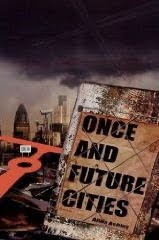 Once and Future Cities serves as a road map to Ashley’s dilapidated, jaded, exhausted world. Every story between its covers is remarkably fresh and well thought out. The dialogue feels real and the prose is crisp, leaving you in no doubt that Allen Ashley is a writer of substance. Many of these tales stay with you long after you turn the last page, and if you’re looking for an original slant on modern life—and more than a few knowing laughs along the way—there’s probably no better place for you to travel than in Once and Future Cities.